This journey through the lives of six great Shakespearean actors and actresses of the 18th through 20th centuries is meant to give each of them a curtain call. In sections titled Life Understudying Art, my late wife and I indicated aspects of their lives that seemed to have been cues from the playwright himself. Although our contentions are often quite serious, feel free to take them lightly. After every second biographical sketch we will pause for comments, questions and the passing around of portraits of those discussed. In 1750 two theater companies, Covent Garden and Drury Lane, staged rival performances of those other rivals, the Capulets and the Montogues. That Garrick, with his short and heavy features, held his own against a handsomer Barry is testimony to his great skill. Still a contemporary woman observing those rival performances of Romeo said that Garrick’s animation was so eager that had she been Juliet, she should have thought he was going to jump up to her, while Barry was so tender and magnetically attractive that, in the same position, she should have felt inclined to jump down to him. ‘Romeo, again!’ and shakes his head. He’s every inch King Lear. 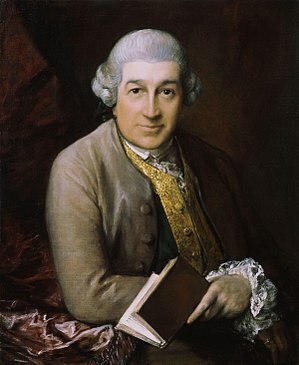 Once a Dr. Hill accused Garrick of pronouncing the i in mirth and birth as if it were a u. Much a court jester, he replied. I’ll change my note soon, and I hope for the better. Might not such a jester have entertained in the court of Garrick’s King Lear. For years after his retirement from the role no one really captured the essence of that king unless of course you count another king, George III. During George’s madness, performances of Lear were suspended but George himself read the play—perhaps back to health. Hamlet: Dost thou hear me old friend; can you play the murder of Gonzago. Hamlet: We’ll hav’t tomorrow night. You could, for a need, study a speech of some dozen or sixteen lines that I would set down and insert in’t, could you not. Garrick took great liberty with the 150 year old plays of Shakespeare often setting down and inserting a dozen or so lines. His Romeo and Juliet, staged at Drury Lane in 1748, was a greater success than earlier rewrites. Garrick had purified Shakespeare’s original, removing many of its bawdy jokes and sexual references, thus reducing Mercutio’s role and simplifying that of Juliet. Understanding his audience’s taste, he had retained the tear-jerking sentimentality of the lovers’ final embraces before death. What emerged was a version which would be taken as the standard stage text for the next 100 years or so. Now such rewrites off Shakespeare seem as base as his own dissatisfaction with the original work, but how often had Shakespeare, as Hamlet, done likewise? Hamlet: For murder, though it have no tongue, will speak with most miraculous organ. I’ll have these players play something like the murder of my father before mine uncle: I’ll observe his looks; I’ll tent him to the quick; if he but blench, I know my course. One day, strolling with Monsey at midday Garrick inserted some lines into the streets of London and its life script. When a host of boys poured out of the school they were passing, he selected one, whom he accused of being viciously cruel to another boy near him. The so-called victim declared that no one had ill-used him. Whereupon Garrick laced it into the imagined offender even more, and observed that he was not entitled to his neighbor’s magnanimity. Garrick’s awesome behavior and piercing eye left the boys agape. The actor assured Monsey that he had learnt a great deal from studying their emotions. This method of better recognizing a human emotional response was often repeated. Foregoing stage tricks, she never permitted her audience to remember for a moment that she was acting. One writer remarked on her quite uncommon practice, at the time, of seeming a part of the action even when silent:”Never did I see her eye wander from the business of the scene.” Most other players tended to lose interest when—so to speak—it wasn’t their turn. Sarah was for the public in her greatest character portrayal, Lady Macbeth, a harsh, cold-hearted woman. Strangely after her retirement she informed the world that all during her long career she had played the role against her own convictions about Shakespeare’s intent. She inwardly felt the lady to be more feminine and fragile. Her irresolution might have been tapped for remorse, her protectiveness of Macbeth, for tenderness and sympathy. Phoebe: Good shepherd, tell this youth what ‘tis to love. Silvius: It is to be all made of sighs and tears; And so am I for Pheobe. Pheobe: And I for Ganymeade. Orlando: And I for Rosalind. Rosalind: And I for no woman. 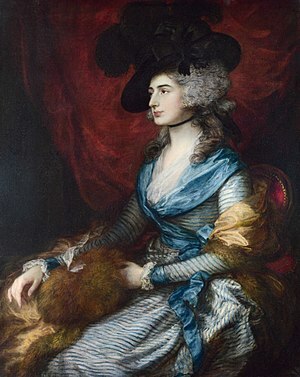 Sarah Siddons had been prudish since girlhood and in the part of Rosalind absolutely refused to appear in breeches; yet by age twenty she became probably the first actress to do Hamlet on stage, repeating the role for many years but never in London. When the curtain came down on her last performance at Leeds, she . . . . But wait, first to King Henry VIII, to her Queen Katherine, to Wolsey. Queen Katherine: Lord Cardinal, to you I speak. Queen Katherine: Sir, I am about to weep; but thinking that we are a queen, or long have dreamed so, certain the daughter of a king, my drops of tears I’ll turn to sparks of fire. Probably moved by her Lady Macbeth, Sir Joshua Reynolds titled the portrait for which she sat, The Tragic Muse. She soon found herself cast in a conflict between styles. Within a year Thomas Gainsborough demonstrated to Reynolds the possibilities of freeing the artist from all but the realities of flesh. 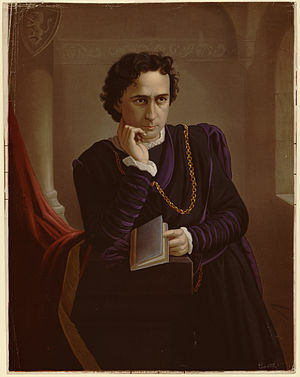 At the onset of this century William Winter wrote, “The most carefully made, the longest and—I believe—best version of Romeo & Juliet on the stage in our time is the one that was made by Henry Irving.” He restored the play to Shakespeare, bringing back in 1878 many sections thought to be irrelevant by his predecessors. 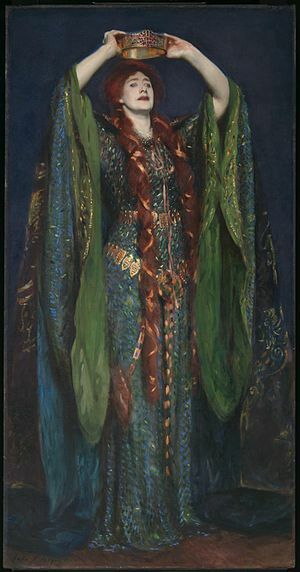 In his staging he set the mood for an interpretation by which he and Ellen Terry delighted audiences: an interpretation that is very much a part of today’s theater. For example, Irving and Terry took the lead roles in a celebrated production at the Lyceum, a place, whose lavish, Italianate settings, processions and crowd scenes, delighted audiences. The most jaw-dropping sequence was that in which Romeo slew Paris in the churchyard and then carried his corpse down a flight of stairs where, by virtue of a seemingly miraculous scene change, he was revealed in the sepulchral gloom of a Gothic crypt. 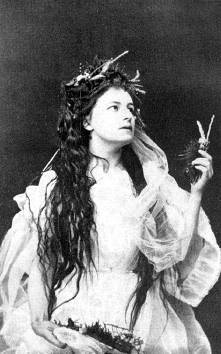 In 1881 Irving teamed up with both Ellen Terry and Edwin Booth whose lives will be covered. They presented Othello with Irving and Booth alternating between the title role and that of Iago while Terry was always their Desdemona. Irving amazed Booth by his bringing talented performers into the lesser parts while Booth amazed Irving by his not letting himself be upstaged. Irving understood that setting, costume and lesser parts all set a mood and hence a course through a play. His posterity would bestow upon him its sincerest form of flattery. In October of 1874 Irving appeared in Hamlet; by this time his reputation was so great that within a few minutes of opening the doors the house was packed. Surprisingly he did not wear, as was the custom, a flaxen wig and princely garb. Instead he wore simple, mourning black, trimmed with fur. This interpretation was so original that the audience kept a breathless silence through the second act.“Silence also ushered in the third act. All was new in this Hamlet—the speech, the dress, the manner. Nothing called to mind the effect-snatching expedients of his predecessors.” By the end of that act’s dialogue with Ophelia, the spell broke in a hurricane of applause. Hamlet: Be not too tame but neither let your own discretion be your tutor: suit the action to the word, the word to the action; with this special observance, that you o’erstep not the modesty of nature: for anything so overdone is from the purpose of playing, whose end but from the first and now, was and is, to hold, as `twere a mirror up to nature; to show virtue her own feature, scorn her own image, and the very age and body of the time his form and pressure. Once more he brought his discerning judgment to the Merchant of Venice. For over a century, dealing with Shylock had marked the plays end. Now Irving broke with that custom of tossing away Act V and with another: he raised the Jew to dignity and sympathy. There were many discussions as to the correctness of such a reading of the character, but from any view there was nothing but praise for the effectiveness of the rendering. The three leading dramatic critics of the day commended Irving’s portrayal of Shylock and Terry’s portrayal of Portia. 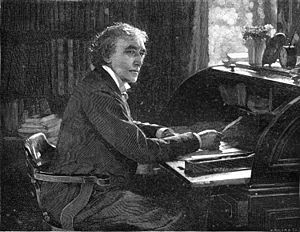 After the play’s 100th performance, a grand testimonial supper was held honoring the Lyceum Theater and especially Henry Irving. Its timing was Valentines Day of 1880, just four years after the Natick Social Reading Club’s first meeting and four months after its first recorded meeting. A guest list numbering 350 was right out of Who’s Who in Great Britain. Lord Houghton got up to give the one toast of the evening but to everyone’s surprise proceeded to alternately roast and toast Irving. The roasting was in earnest for Irving’s rehabilitation of Shylock. Perhaps the toasting was also in earnest or perhaps merely to ensure a safe exit from a crowd buoyantly pro Irving. The speech was not a happy one nor in good taste for such an occasion—the celebration of the marked success of a play. Irving might have picked up on and debated the issue of Shylock, returning blow for blow, but something else moved his response. There was basic warmth between himself and his guests. He would not let petty bickering detract from that. He finished with the beautiful words of Shakespeare. The ovation was a thunderous sea of waving handkerchiefs and seemed interminable. He had defended his interpretation without a sparring distraction from the evening’s celebration much as Mark Anthony had defended his Caesar without distracting from the solemnity of his death. Anthony: The noble Brutus hath told you Caesar was ambitious: if it were so, it was a grievous fault, and grievously hath Caesar answer’d it. Early in Irving’s career a Manchester critic suggested that he do away with his jerking walk, stiff neck and spasmodic elocution claiming that they added nothing to the character. Well, what the critic saw was what he and audiences were to get for some time and even come to prefer, for they were inherent in the man. He did his best to overcome these defects and finally made them so subservient to himself and to his qualities that, in the end, they did not matter. And although George Bernard Shaw was more critical he admitted that every famous man of the last quarter century was in love with her. Actually he and Terry had a platonic love affair consummated with over two hundred ardent letters. By terms too numerous for our reference Shakespeare either gave Ellen Terry permission to become the strong woman she was, or he convinced her that she needed no such permission. There had been some suggestion in about 1924 that Ellen, then 77, should be placed in a mental institution; she was considered by some to be a danger to herself. During the night she would wander about the house at Smallhythe, talking to herself and tracing the fading memories of her past. That past was enshrined in the objects of every room, in memories looking back at her from portraits and pictures on every wall. She could not sleep but would wander out into the dark, early morning garden. There–true to the advice of a late, dear friend–she would search for the moon. It would have been merciless to part her from the treasures of house and garden; fortunately the proposal was successfully obstructed. There Terry’s final days were filled with mumblings, mostly guided as she had been on stage by her own annotations, mostly from Macbeth (i.e.). If Romeo was Booth’s worst part, Hamlet was his best. The New York Times declared it “a part in which he has no living equal.” This Hamlet, this best foot was what he put forward on the night he returned from a one year absence from the stage. As one man, the audience leaped to its feet and cheered and cheered in a mass of waving white handkerchiefs. But I must tell you that his performance had not yet begun. Their enthusiasm was about his courage in returning at all, returning from what follows. In November of 1864 Edwin appeared with his brothers Junius and John Wilkes at the Winter Garden Theater. Their performance of Julius Caesar, not brilliant but earnest and commendable, had been a first run for the Booths, both individually and collectively. Brutus: What means this shouting? I do fear, the people choose Caesar for their king. Cassius: Ay, do you fear it? So then must I think you would not have it so. It was Lincoln’s assassination from which Edwin Booth was returning to the stage. When Edwin’s wife Mary died he admitted to a friend, “My grief eats me.” And well it might have for a brief time ago she was with fever in Boston and needed him desperately, while he was performing in New York with drunken stupor and needed her desperately. At her freshly dug grave his despair was remarked to have matched that at Ophelia’s stage grave. Haunted by thoughts of Mary, he chose what would have been her next birthday to help her spirit seek him out. He visited Laura Edmonds, the spiritualist. Ghost: Pity me not, but lend thy serious hearing to what I shall unfold. Ghost: So art though to revenge when though shalt hear. At age thirty-five Helena then a renown, Polish actress traveled to America and for a while refrained from performing. Instead she farmed and studied English. When she returned to the stage she brought along her Polish accent. For some this was enchanting but for others it was just not Elizabethan. Once when she was past sixty she played Juliet to rave reviews. Her portrayal was so convincing that no one thought of mentioning her age, but mentioning her accent was quite another thing. Still for most, that accent became—much as Irving’s awkward elocution–a valued signature of her performance. Perhaps such qualities were what moved a London crowd to unhook the horse from her carriage and pull her through the streets one day. In the Kracow of her youth Helena was in love with a Jewish boy, named Igo. To separate them her family sent her to a nunnery but not before she promised to be with him on St. John’s Eve. It was the custom of that eve for a girl to wear a garland and in time toss it into the Vistula River. If a lad thought enough of her he would fetch it back for her. Joyous was the celebration outside the convent walls. She feigned an interest in placing flowers at a statue of the Virgin Mary but instead picked the flowers up to a tree, onto it and over a broken-glass wall and woven into a garland, onto her head and into the arms of her beloved Igo. That evening was so splendid, so misunderstood that she would rehash it again and again for the rest of her life. Could it have helped but to work its way into her portrayals of Ophelia’s anxiety with a threatened nunnery, or Juliet’s need for her beloved? Might those same characters each in their turn have displaced her in the recollecting of herself, that evening and that love she ended up denying? Henry Wadsworth Longfellow once came back stage at the Boston Museum to compliment her performance. During the next few days he showed her the city and his home in Cambridge. One day out by the harbor they kidded each other. Modjeska: Any stretch of water has a profound effect on me, particularly the sea. It stirs me in a certain mysterious way. Longfellow (smiling): That’s very interesting because you know for me water means just simply water. I don’t recognize the language. Longfellow: It has a beautiful sound. Modjeska: No more beautiful than the language of Shakespeare and Longfellow. Longfellow: Then it is my turn to thank you, my dear, for putting my name by that of Shakespeare. Then he asked her to recite something in her native tongue and she put forth some rhythmic stanzas. Longfellow: Whose poetry was that? Something of Mickiewicz? Modjeska: It was merely the Polish alphabet. And then interrupted himself and wished that he were thirty years younger. Helena of Krakow had undertaken an immense journey that had brought her as close as was then possible to Shakespeare, himself, to a Shakespeare incarnate in Longfellow. Rumor: Just before one of the two occasions during which Helena Modjeska and Sarah Bernhardt shared a stage, there had been a bustling about to prepare that theater. The work crews were all excitedly (wo)manned. Windows to the outside were covered and exits, latched from the inside. When the box office opened only women were allowed to enter, so that when each performance began, an actress looked out upon a large all woman auditorium. With both back stage, I cannot imagine anyone, but for the (wo)manned crew and organizers, knowing what was next on the program; but I may be prejudiced. My late wife was a professional keeper of secrets, yet I always imagined there to be few other women who could do so. The mistress of ceremonies came forward and announced a competition between these two great actresses: each would do a particular monologue from Hamlet, and do so without a stitch of clothing. Then those in the audience would vote their preference: a close vote which Helena Modjeska won. By my first reading of this event and its outcome, I had already chosen her from the two to be my sixth and last actor. Fact: Her son, Ralph Modjeski, was world-famous as a designer of bridges and rail lines. He pioneered suspension bridges and, in all, built nearly 40 bridges spanning the great rivers of North America. He also trained succeeding generations of American bridge designers and builders, including Joseph B. Strauss, chief engineer of San Francisco’s Golden Gate Bridge (completed six months after Modjeski’s own nearby Oakland Bay Bridge). This entry was posted in Presentations and tagged Shakespeare. Bookmark the permalink.